On a Mac system, these are also described in /usr/include/mach-o/loader.h. Definition at line 24 of file MCSectionMachO.h. Definition at line 84 of file MCSectionMachO.h. Definition at line 47 of file MCSectionMachO.h. Referenced by canGoAfterDWARF(), canUseLocalRelocation(), llvm::MCAsmInfoDarwin::isSectionAtomizableBySymbols(), and PrintSwitchToSection(). Definition at line 41 of file MCSectionMachO.h. Referenced by canGoAfterDWARF(), canUseLocalRelocation(), getPlatformName(), llvm::MCAsmInfoDarwin::isSectionAtomizableBySymbols(), and PrintSwitchToSection(). Definition at line 55 of file MCSectionMachO.h. Definition at line 57 of file MCSectionMachO.h. Referenced by llvm::MachObjectWriter::bindIndirectSymbols(), canUseLocalRelocation(), llvm::MCAsmInfoDarwin::isSectionAtomizableBySymbols(), isVirtualSection(), and PrintSwitchToSection(). Definition at line 54 of file MCSectionMachO.h. Referenced by llvm::TargetLoweringObjectFileMachO::getExplicitSectionGlobal(), and PrintSwitchToSection(). 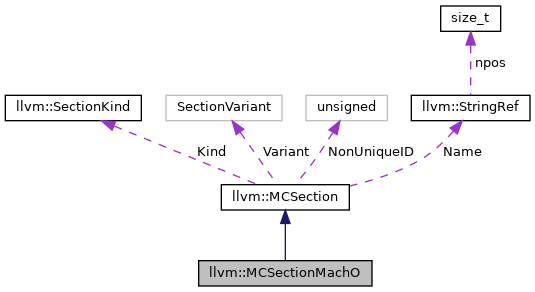 Definition at line 61 of file MCSectionMachO.h. References isVirtualSection(), ParseSectionSpecifier(), PrintSwitchToSection(), and UseCodeAlign(). Referenced by canUseLocalRelocation(), canUsePrivateLabel(), getFixupKindLog2Size(), and UseCodeAlign(). Definition at line 171 of file MCSectionMachO.cpp. References getType(), llvm::MachO::S_GB_ZEROFILL, llvm::MachO::S_THREAD_LOCAL_ZEROFILL, and llvm::MachO::S_ZEROFILL. Referenced by hasAttribute(), and llvm::MachObjectWriter::writeSection(). Parse the section specifier indicated by "Spec". ParseSectionSpecifier - Parse the section specifier indicated by "Spec". This is a string that can appear after a .section directive in a mach-o flavored .s file. If successful, this fills in the specified Out parameters and returns an empty string. When an invalid section specifier is present, this returns a string indicating the problem. If no TAA was parsed, TAA is not altered, and TAAWasSet becomes false. This is a string that can appear after a .section directive in a mach-o flavored .s file. If successful, this fills in the specified Out parameters and returns an empty string. When an invalid section specifier is present, this returns a string indicating the problem. Definition at line 182 of file MCSectionMachO.cpp. References llvm::AMDGPU::HSAMD::Kernel::Key::Attrs, llvm::sys::path::begin(), llvm::StringRef::empty(), llvm::sys::path::end(), llvm::find_if(), llvm::StringRef::getAsInteger(), llvm::MachO::S_SYMBOL_STUBS, llvm::MachO::SECTION_TYPE, SectionAttrDescriptors, SectionTypeDescriptors, llvm::SmallVectorBase::size(), llvm::StringRef::size(), and llvm::StringRef::split(). Referenced by llvm::TargetLoweringObjectFileMachO::emitModuleMetadata(), llvm::TargetLoweringObjectFileMachO::getExplicitSectionGlobal(), hasAttribute(), and instrumentMaskedLoadOrStore(). Definition at line 103 of file MCSectionMachO.cpp. References AssemblerName, assert(), AttrFlag, llvm::StringRef::empty(), getSectionName(), getSegmentName(), getType(), getTypeAndAttributes(), llvm::MachO::LAST_KNOWN_SECTION_TYPE, llvm::MachO::SECTION_ATTRIBUTES, SectionAttrDescriptors, and SectionTypeDescriptors. Definition at line 167 of file MCSectionMachO.cpp. Definition at line 38 of file MCSectionMachO.h.